This pattern is from the current 2016/17 Marfy catalogue. It has a strong 1970’s influence which is enhanced by the fabric used. Purchased at The Fabric Store in Brisbane, the base fabric is cotton with a fancy square weave which was available in the 70’s but not for many years since. 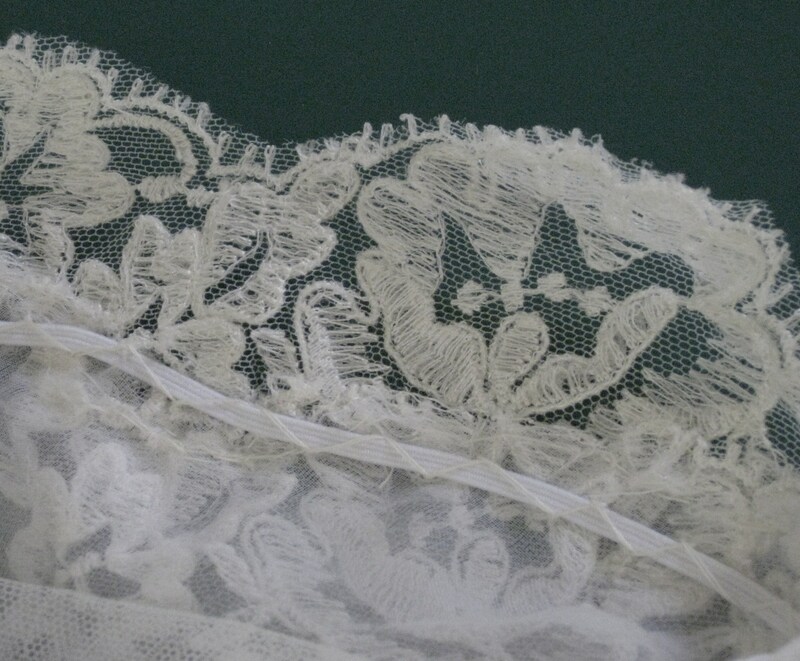 The overlay is a very soft, nylon lace – also very popular in that era. In addition to the curved panel and hem band in the original pattern, I have continued the overlay over the left shoulder and partially across the back hem edge to bring interest to the back as well as the front. Marfy Patterns is a family owned and operated company based in Ferrara, Italy since 1966. They produce a catalogue in January each year which can be ordered directly and shipped to Australia. The catalogue includes several free patterns with each issue. While a number of the patterns can be viewed on the McCall’s website – https://mccallpattern.mccall.com/brand/marfy – they are not sold by McCall’s outside of the United States. The patterns can be purchased from http://www.marfy.it/our-patterns/ or by choosing a style from the catalogue and ordering by email. They come in single size, printed and pre-cut using onion skin paper. They have no seam allowances added and do not come with a guide sheet. While all the pattern pieces are labelled and have letters to indicate joining points, it is best to trace the pattern on to greaseproof to make any fitting alterations needed before a trial garment is cut in calico. Apart from helping to see what further alterations may be needed, making a trial garment is very helpful in understanding how the garment goes together. Once the toile has been fitted and the working pattern altered, it can be laid out on a gridded cutting board to assess the amount of fabric that will be required. Marfy provide basic guidelines for fabric needed but this needs to be checked to make sure the chosen yardage will be sufficient. the stability of the fabric – does it fray easily? This garment has a curved feature panel and has an all in one armhole and neckline facing. The side seams have been sewn using the standard 15mm while 1cm was used around neck and armhole openings. While I initially intended to use 1cm seams in the curved seams on either side of the feature panel, the thickness of the overlay made the narrow seams more bulky. Once the seams were sewn, the overlay seam allowances were pared back between the layers of main fabric. This resulted in a flatter join. Overlay trimmed from seam allowance to reduce bulk and seam allowances clipped to allow them to lie flat. Tip: Before deciding on hem or seam allowance widths, it is important to make some samples using the chosen fabric and to finish and press them as they will be in the garment in order to see how the fabric behaves. Since the pattern gives no indication of a suggested hem finish or pressing direction for seams, testing beforehand is a must. Each piece of the pattern needs to be cut once only so it is important to carefully label the right side of the pattern pieces which are placed on the fabric laid right side up as well. Seam lines and match points were marked on wrong side in curved areas. This was done with dressmaker’s carbon and a tracing wheel and helps with accurate seam piecing. Once all base fabric pieces have been cut and match points marked, cut the overlay and position it on the appropriate garment pieces. Hand tack the layers together within the seam allowance so they will not move during construction. 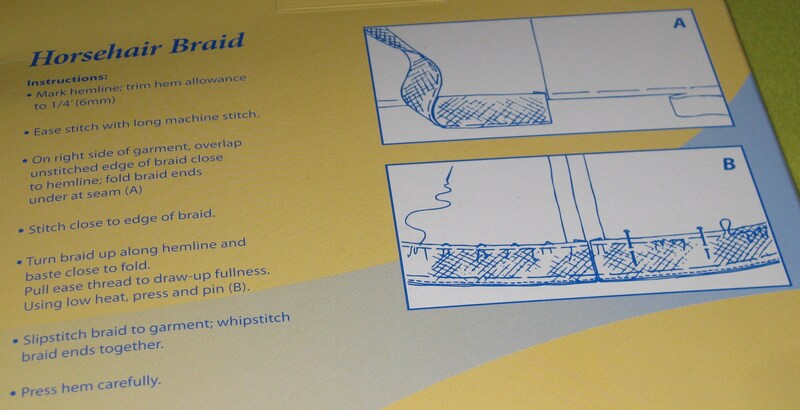 The concave curves on both sides of the inset panel have been staystitched just inside the seam allowance – stitch length 2.0 – to protect the seam if clipping is required after the seam has been stitched. While the curves are quite pronounced, they are quite long which makes it easier to achieve smooth seams. The key to this is to pin at right angles to the stitching line taking a very small bite of fabric and making sure that the cut edges of both pieces are perfectly aligned. Hand tacking before machining makes the sewing easier. Tip: Sew with the curve and do not attempt to straighten it while machining. Careful marking is essential. Depending on the fabric, mark or thread trace the seam lines to indicate the exact shape of the inside corner and the exact point of the corner on the outside corner. Position a 5cm square of silk organza on the right side of the fabric, centred over the corner point. Stay stitch along the marked seam lines. Clip exactly to the corner and turn the organza to the wrong side. Press the seam allowance open and then press the patch flat against the wrong side of the fabric. Pin the corner match points and, starting at the corner, stitch out along the seam line on each side of the corner before stitching the remainder of the seams. If using an overlay, be careful to trim away any bulk in between the seam allowances. The seam allowances should be pressed flat as sewn before assessing which way to treat the seam finishing. There are several options for the direction to press the curved seams and they all depend on the fabric being used and the desired finish. With a single fabric layer garment, seams can be pressed flat and then open, perhaps with topstitching on either side of the seam line. They can also be pressed either to the main garment or towards the overlay. Whichever is chosen will make the area towards which the seams are pressed advance to become more of a highlight. Because of the thickness of the overlay, I decided to go with this latter option as having thick seams under the main fabric made the seams look very bulky. Once pressed, the seam allowances were clipped where necessary to allow them to lay flat and the edges overlocked together. 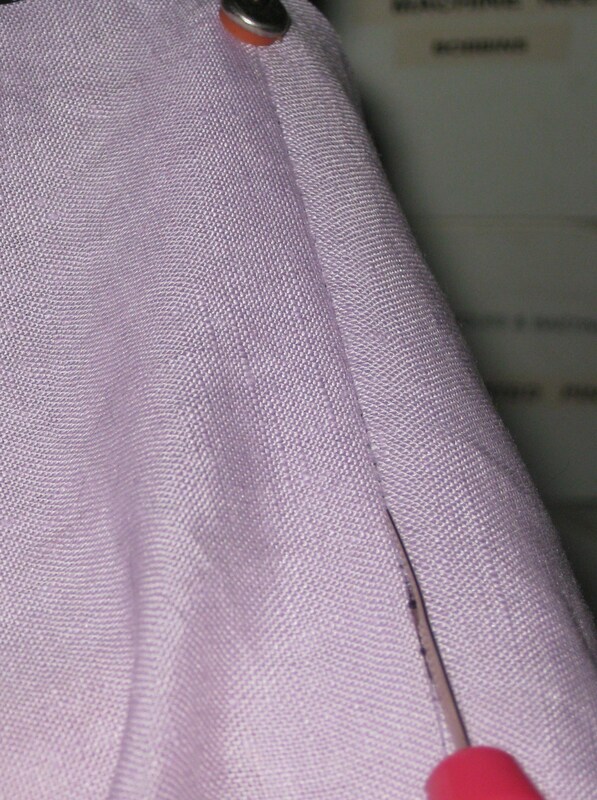 Because of the thickness of the overlay and fabric together, a facing has been applied to finish the hem. It was cut from the main fabric and applied across the full width of the band before being hand stitched in place. If I had been using a single layer fabric, I would have most likely turned up a 5cm hem, finished the upper edge with the overlocker and hand stitched it in place. Again, the thickness of the overlay needed to be taken into consideration when the facing was applied. 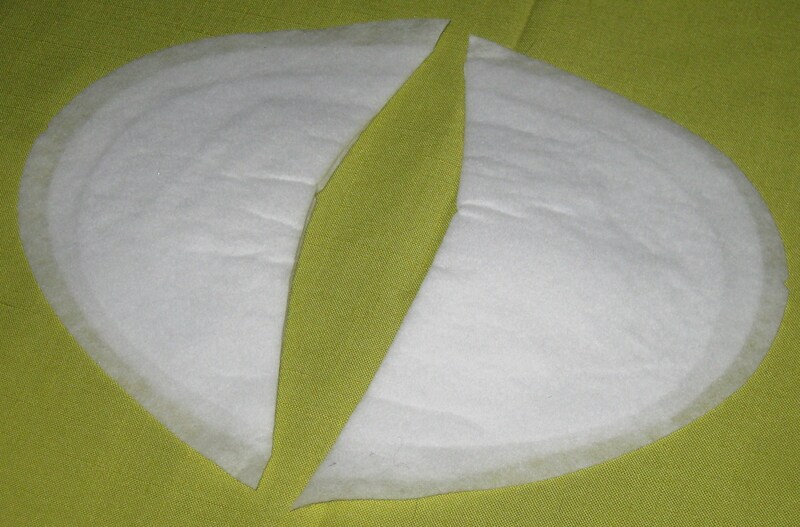 To minimise bulk, the facing was cut from a finer cotton fabric. The usual method of leaving three open seams and completing the neckline and armhole edges before pulling the whole garment through the shoulders would have been problematic with the thickness of the overlay, even though the shoulder seams are wide. Consequently, I seamed the shoulders and armholes of the facing and completed the neckline edge, including trimming, clipping and under stitching. Because of the wide shoulders, it was relatively simple to reach inside the turn the fabric so that the armhole seam could be machined – this method was the same as stitching a sleeve lining by machine in a lined jacket. Hand under stitching completed the armhole facing and has also been used to anchor the facing and shoulder seams in place. An invisible zipper has been used for the back closure. 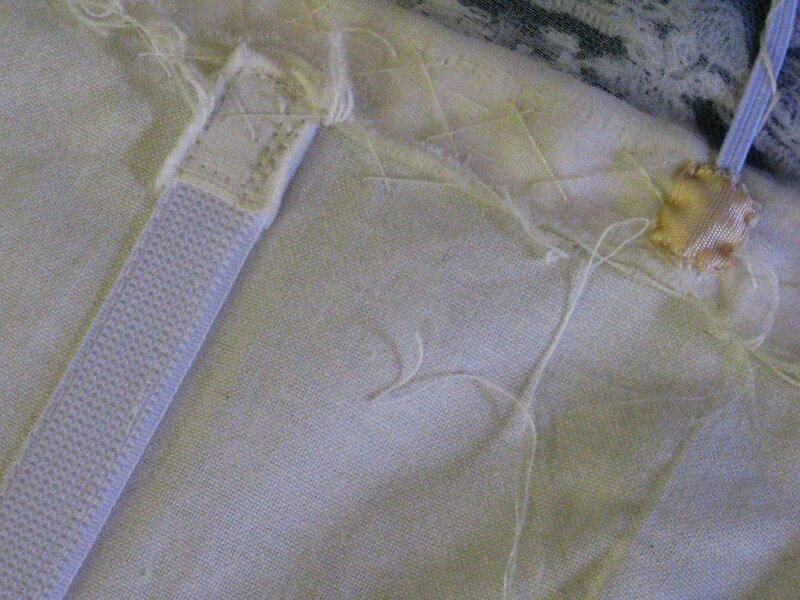 The zipper tapes were machine tacked in place before final stitching. To avoid bulk at the neckline, stitching is started level with the top of the plastic zipper stop. 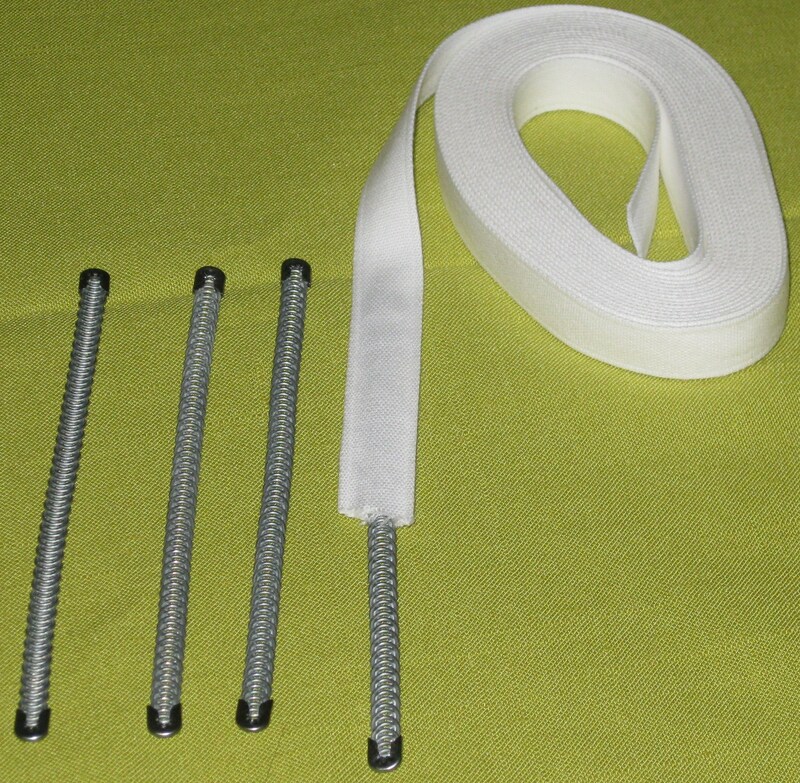 When facing is to be applied, zipper tapes are folded back so they are not included in the seam. Facing is stitched right through to the seam edge at centre back. Using the zipper foot, stitch the facing seam allowance to the garment seam along the side of the zipper tape. 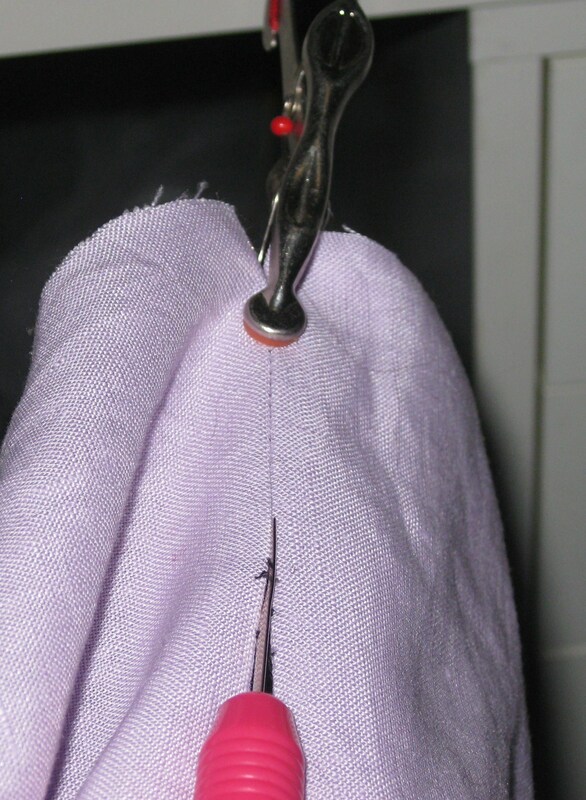 To clean finish the top of the zipper, place zipper foot blade on the garment side of the zipper teeth and stitch through neckline seam down approximately 6mm. 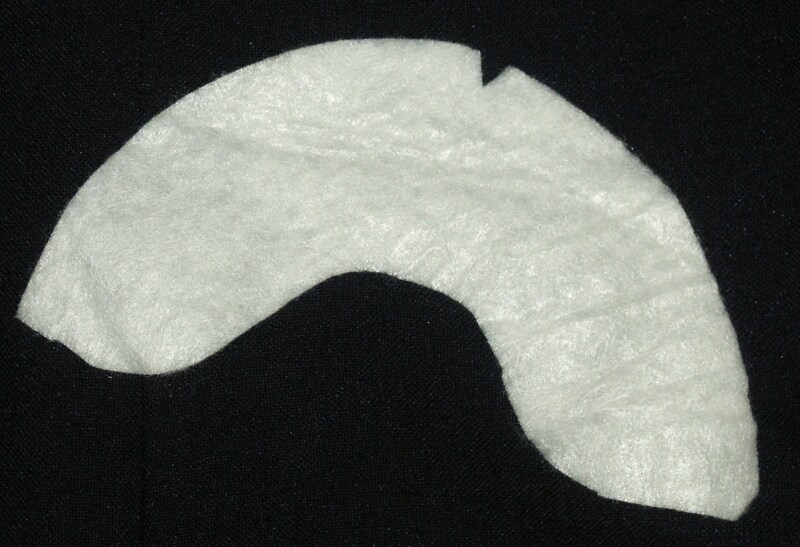 This technique forms a pocket which holds the plastic zipper stops so they are not visible from the right side of the garment. Marfy patterns are a wonderfully stylish range, many of which have simple lines and details. The cut is superb and well worth a try by any sewer of average ability. Do give them a go! The catalogue for this year “Marfy Evergreen” has just been released featuring a broader size range and highlighting their landmark dresses, tops, pants and skirts as well as classic jackets and coats and evening wear. It can be ordered directly from http://www.marfy.it . During construction – before hem and final steam press. With its flattering, asymmetrical lines and interesting front pleat detail, this dress makes a versatile wardrobe piece. The description on the pattern envelope states that it is intended for medium knits only. However, by making a woven toile for fitting, any necessary pattern alterations can be made so that the fit is adjusted to accommodate a woven fabric. The only changes needed for this garment were a little more width across the back and front at bust level. The fabric is Italian silk and polyamide was purchased at Alla Moda in Brisbane. It is a most unusual fabric – the warp threads are artificially manufactured polyamide (an extremely fine fibre sold as nylon in all parts of the world ) and the weft threads are silk woven in an intricate diagonal twist pattern. It is beautifully soft with a slightly springy hand and is resistant to creasing. The dress has been underlined with a silk and cotton blend to support the fabric and minimise the seam shadows with occur when using a plain fabric in a pale colour. This garment is a perfect candidate for underling and, while it is a relatively simple style, meticulous marking is needed to ensure that the diagonal lines align perfectly and that the unusual attachment of the front bodice to the front skirt section is easily accomplished. Pleats in the skirt also need to be accurately positioned. The garment has only the sleeves cut from double fabric. The remaining pieces were cut single layer and the fabric pieces (with pattern still attached) placed on grain on the underlining fabric which was then cut. This ensured accuracy in grain and fabric edges. Stranded embroidery floss is excellent for thread marking as it is quite weak (2 strands only at a time) and easy to remove. All fabric and underlining pieces were tacked together at the cut edges of each piece. Sometimes the difference in weights of the fabric and the underlining can cause distortion at the garment hem. To alleviate this, a 25mm fold has been added to the underlining approximately 15cm above the finished hem. This creates a jump hem so the underlining will not pull against the garment fabric over time. The fold was added before the final tacking of the underlining to each lower garment piece and to the sleeves. Tip: Make a diagonal stitch when turning corners. This stitch can be snipped later for easy removal of individual sections during construction. 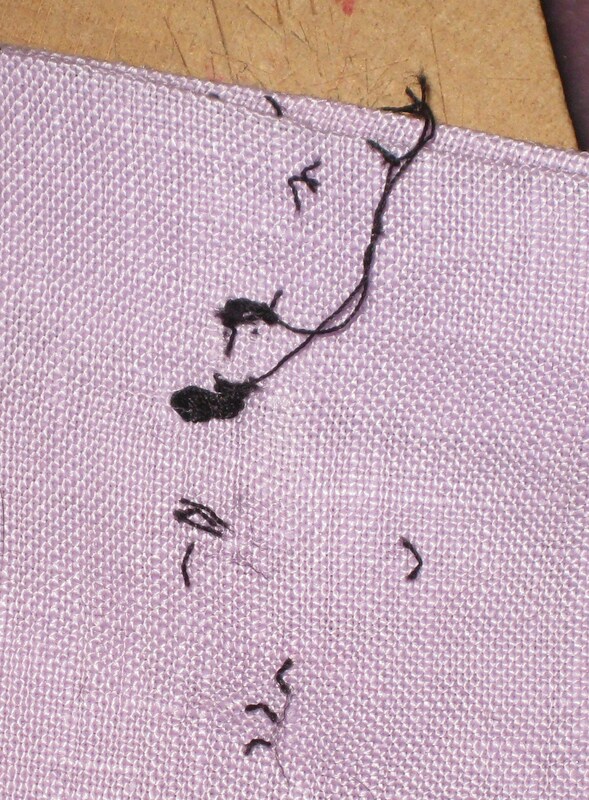 Notches are marked with short running stitches. Dart points and dots indicating the ends of pleats are marked with a single stitch tailor’s tack. 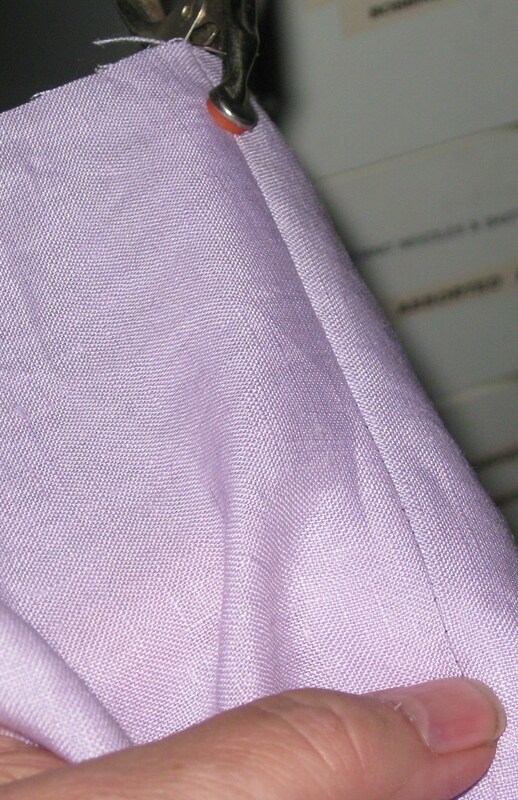 Continuous tailor’s tacks have been used to mark the fold lines for pleats. To ensure layers of fabric stay together when sewing pleats and darts, a tacking stitch was applied down the centre of these elements. 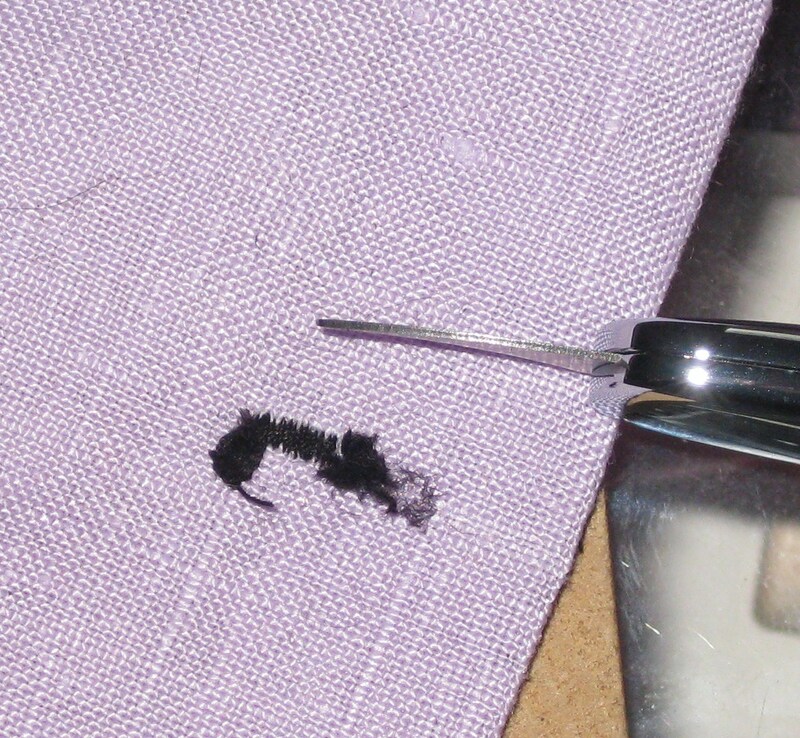 For later removal of the tacking, a pair of thread tweezers is a very helpful tool. Machine staystitching using a small stitch length (1.5) was applied close to the seam line, directionally around the neckline. This was also done close to the diagonal seam lines to minimise stretching of bias grain when seams were pinned in place. Narrow strips of lining selvage were tacked in place along diagonal seam lines and were permanently attached as seams were sewn. This will help the garment to keep its shape and avoid stretching in the skirt when it is being worn. 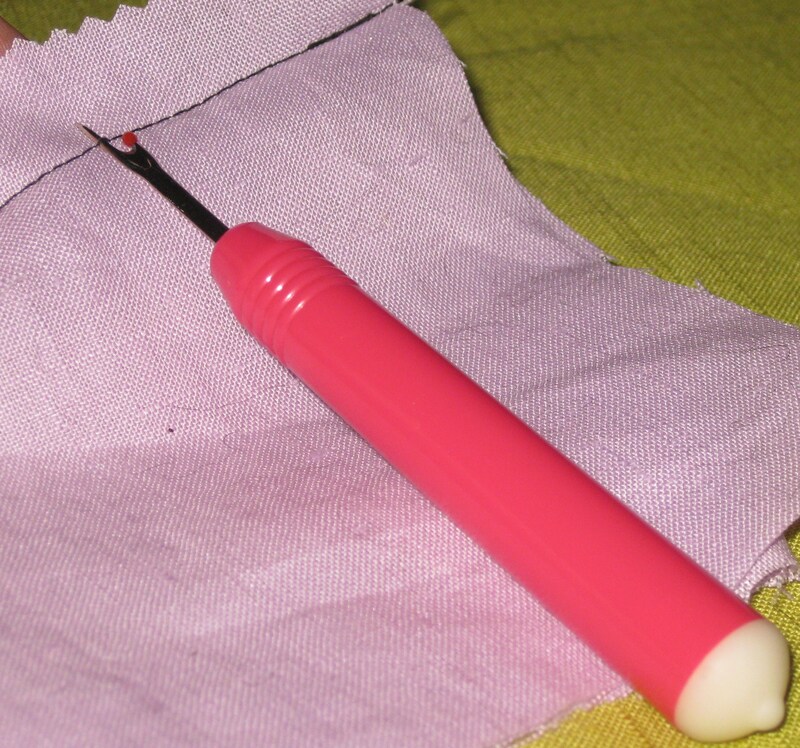 Darts have been sewn before being slashed open and edges catch stitched to the underlining so that they remain flat and in place. Since the garment is not lined, a strip of straight grain lining fabric has been hand stitched over the opened darts. This gives a neat finish and prevents future fraying of the cut edges. The pattern instructions suggest that the front bodice seam is pressed towards the centre and diagonal seams and waist seam are pressed towards the top of the garment. This results in quite unattractive bulky ridges in all of these areas, especially when using a fabric with a springy hand and a shiny surface. A better way with this fabric was to bind all the seam edges with bias strips (Hong Kong finish) and gently press the seam allowances open. The strips were marked on bias cut lining fabric and carefully cut with scissors before being pre-shrunk. I started with 4cm strips but this needs to be tested on scraps of fabric first as not all fabrics will shrink to the same degree. So that the seams remain open during the life of the garment, the seam edges have been catch stitched to the underlining. The result is lovely smooth lines on the right side of the garment. An invisible zipper has been inserted. Lining up the diagonal seam was rather tricky though. I usually attach one side of the zipper and mark the tape on the other side to make it easy to line up as the second side is stitched. However, with diagonal seam, the position of the seam line changes with the alignment of the roll of the fabric towards the zipper coil once the zip is sewn in place. It took a couple of tries with tacking the second tape in place before stitching to gauge the exact position of the second side but the result was worth it. The left front of the skirt features pleats at the waist. Careful marking made it quite easy to position the folds in the correct direction before the folds were tacked in place. Tip: When folding pleats or tucks, it is important to remember that the directional arrows on the pattern apply to the fabric right side up. Thread marking makes accuracy so much easier. The folded extension from the bodice is sewn into a pleat on the skirt. Positioning of this element is also critical. Once the end of the extension was pinned in place, it was fell tacked so that it would not move when stitched from the wrong side. Fell tacking (sometimes called slip basting) is a very useful hand technique to control the exact positioning of fabric layers. The needle is inserted along the upper fold and then the piece to be joined, making sure that the needle penetrates right through all layers. 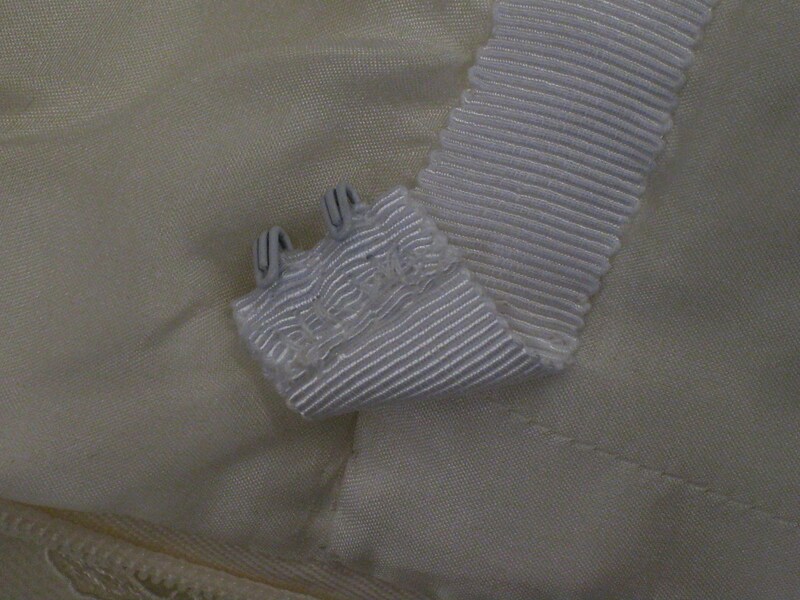 Once the tacking is completed, an accurate stitching line has been marked on the wrong side of the fabric. Sleeves were inserted and the armhole seam allowances finished with double binding, hand stitched in place. Facing pattern pieces are provided. However, to avoid show through on the finished garment, these have been replaced with wide bias binding made from the underlining fabric and applied by hand to give a softly rolled neckline finish. Bias strip has been shaped first with the iron before being fell stitched in place just inside the neckline and the outer edge to the underlining. The sleeve and skirt hems have also been finished with bias binding made from underlining fabric which has been attached as it was to the neckline. Hem and sleeve hem allowances have been turned up and a strip of 25mm bias fell stitched to the hem allowance and to the underlining. Outer edges (neckline, sleeve and skirt hems) are steamed and hand pressed for a softly rolled finish. While not all of these techniques will be used with all projects or fabrics, I hope knowing how to get the best from special and expensive fabric will hopefully encourage anyone who is not familiar with these methods to give them a try. As most people would be aware, there are no sizing standards in ready to wear clothing in Australia (or elsewhere I suspect). Even if the industry is using standardised slopers/blocks, the preferences for grading between sizes and ease vary widely from brand to brand (which is why when we find a brand that “fits” we usually stick to it). Most of these issues can be addressed by gaining an understanding of ease. There are two types of ease. The first is wearing ease which is added to the basic body measurements so that the wearer can move and breathe in a very fitted garment. This is the base from which all designs are then developed. The second type of ease is called design or fashion ease. The amounts used are at the discretion of the designer or pattern company to achieve the “look” they want or that fashion demands. Through all of this fashion change, body shapes have evolved as well. A lot of young women are much taller than those of us born in the 1940’s-50’s. Women’s lifestyles have also changed enormously. There is much more focus on exercise as well as many more sedentary jobs and leisure pursuits. Unfortunately today we live in era of mass production and the demand for ever cheaper clothing. Most people are not aware of how wonderfully comfortable it feels to wear a custom made to measure garment compared to “if it zips, it fits” – no matter what the price! It is totally unrealistic to expect that patterns will fit each individual straight out of the envelope. The cost alone would be prohibitive and this has been the case since paper patterns were introduced for the home sewer in the late 1900’s. The crux of the matter is whether our own individual body measurements coupled with our preferences regarding the amount of ease we are comfortable wearing matches the finished sizing of the garment (or indeed commercial pattern). Major factors affecting the fit of garments are skeletal frame and body posture, often to a far greater degree than body size. So where does this leave us as sewers? We have the ability to take the elements of the current fashion and incorporate them into stylish, comfortable garments which flatter and are made to fit our own individual body shape and proportions. It does not matter what size or shape we are, by accepting what is (we cannot change our skeletal frame!) and making friends with the tape measure, we can learn to adjust commercial patterns for our own individual requirements. 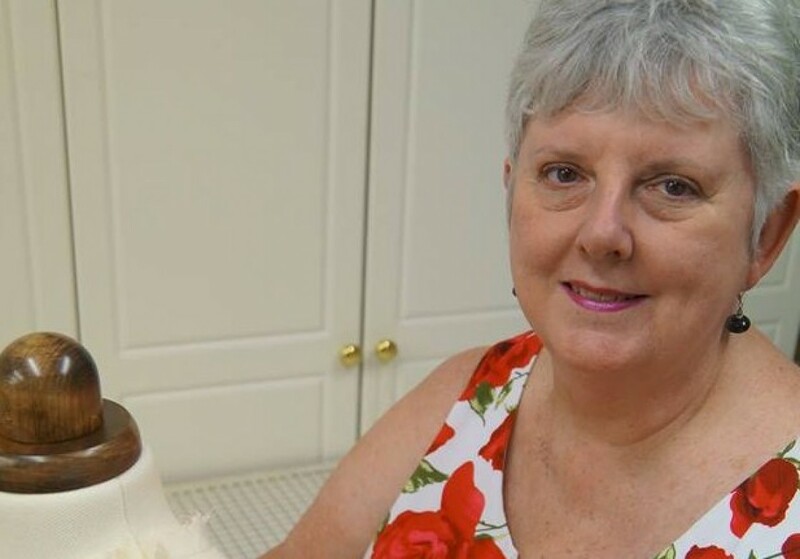 My post on 20th July, 2015 covered how and where to measure the body; selecting the best pattern size; the order of making pattern alterations and the vital importance of making a trial garment (called a toile or muslin). In this post, I will discuss how to prepare a commercial pattern to assess what initial changes can be made before cutting the toile. When taking measurements, wear the undergarments you intend to wear with the finished garment and a close fitting garment (leotard) if desired. Also wear the type of shoes you will wear with the finished garment. The height of the heel affects the spinal alignment and posture. Also use sticky dots to mark the position of each side seam level with the full bust, waist, and high and low hip positions. Be sure to keep the alignment of the side seam perpendicular to the floor. To preserve the original pattern, it is a good idea to trace each pattern piece, (complete with all markings, grain line and seam lines) on to grease proof paper or your preferred pattern making paper. On both front and back bodice, skirt or pant pieces, use a coloured pencil and markers to draw in horizontal lines relating to the position that body measurements are taken. All lines need to be at right angles (perpendicular) to the grain line on the pattern pieces. In my next post I will discuss how to compare your measurements to the pattern measurements as well as how and where to make alterations so that, when you try on the toile, you will have the pattern shaping in the correct position and enough width to start with. Even though minor adjustments may still be needed, the fitting process will be simpler. There are two things that make a huge difference to the success and appearance of a finished project – careful pressing and the removal of bulk. Accurate cutting is the foundation of every garment; not only is the importance of accuracy with the initial cutting of the fabric critical to a good result, but also during construction when clipping, trimming and grading to reduce bulk. Using the best tool for each cutting task makes it much easier to cut and trim accurately; rip and remove wrong stitching and remove temporary threads without damaging precious fabric. Soft Canary 210cm dressmaking shears – they are light and easy to handle with arthritic hands and they cut like a hot knife through butter! 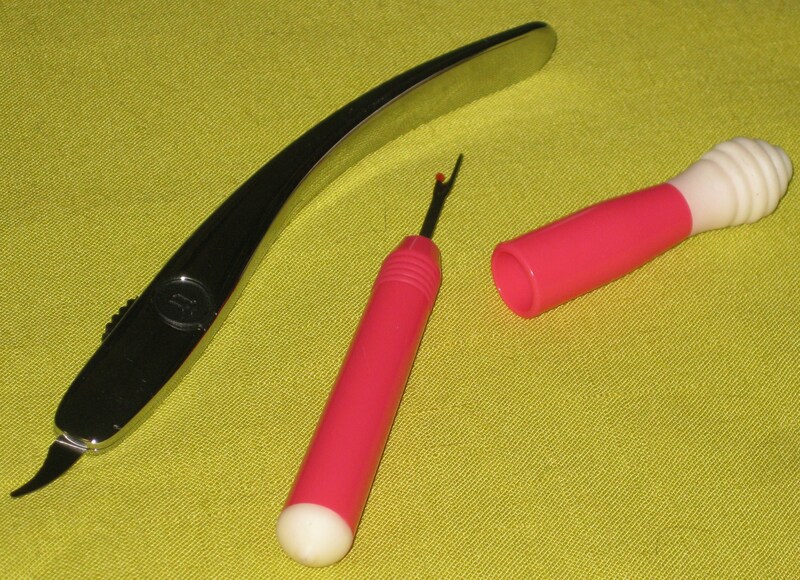 Soft Canary pinking shears – an oldie but a goodie! Sometimes any additional treatment to a seam edge can eventually show through to the right side of the garment. These little bias cuts prevent further fraying of the fabric and keep the cut edges soft and light. Gingher Tailor’s Points – my very favourite – wonderful for clipping, trimming and grading – very sharp right to the point and very strong. 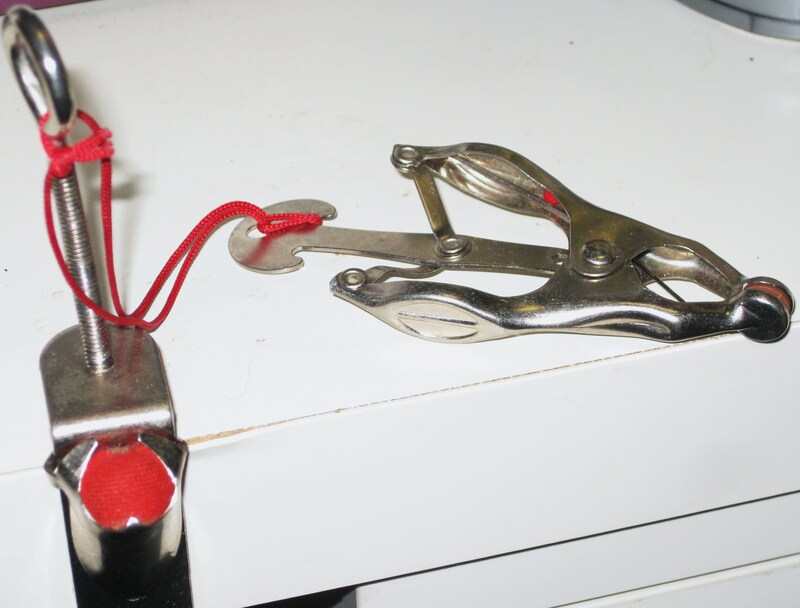 Control thread snips by placing finger through opening. Rotary cutters – 45mm and 18mm blade – I have always used these wonderful cutters top cut straight waistbands, buttonhole lips, pocket flaps and bias strips. The smaller blade is excellent and more accurate for cutting curved edges. Perhaps if my arthritis worsens, I will try cutting out my fabrics as I know there are many sewists who swear by this method. I will need to practice first I think as it can sometimes be difficult to change the habits of a lifetime of sewing. Another important cutting task is the dreaded unpicking. Using patience and the right tools for the job can make this inevitable task much less stressful (on the sewist and the fabric!). 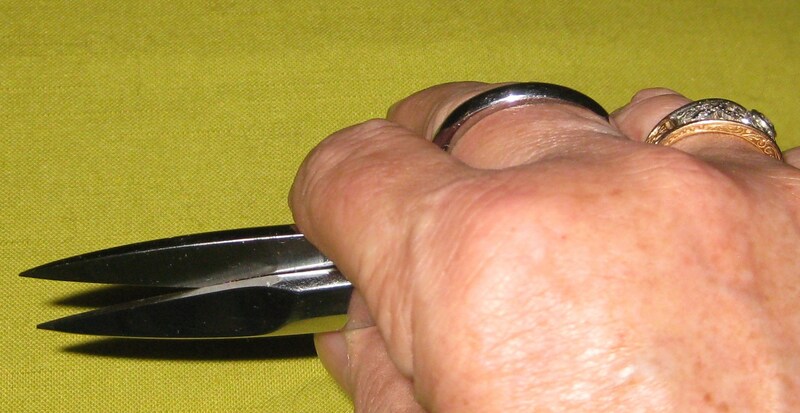 A buttonhole mess – gently and slowly pass the blade over the underside of the stitching. I place my wooden block underneath so there are no accidents! Turn work to right side and gently release the thread which was cut away underneath; remove remaining fluff with thread remover. Unpicker – a good size handle grip which fills your hand together with the “red dot” is an invaluable tool. 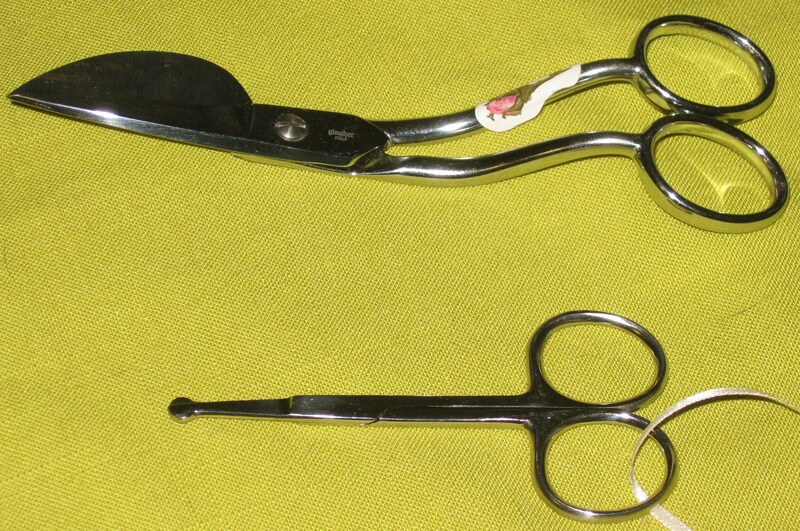 The way most sewists were taught to use an unpicker – slide the blade under and break the stitches. Insert red ball on the end of the unpicker between the stitches and push forward to open the seam. Seam opens ahead of the unpicker. 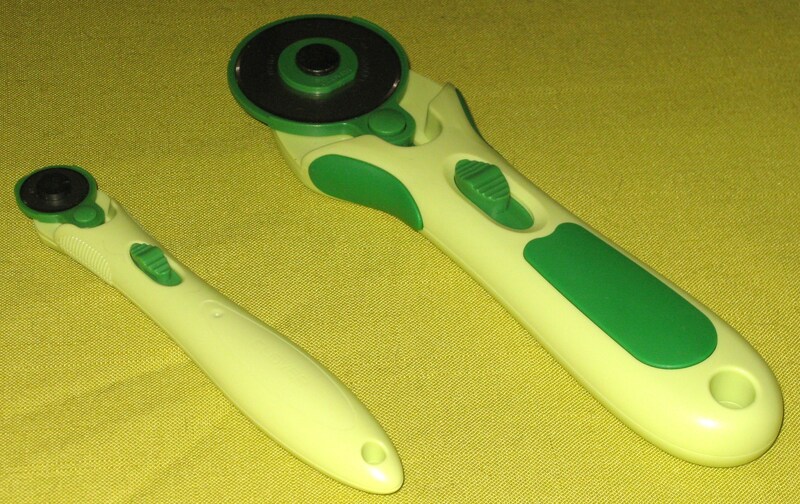 Clover thread tweezers – a new acquisition and they are superb! As with all of our precious tools, care and maintenance is paramount to ensure their long and useful life. 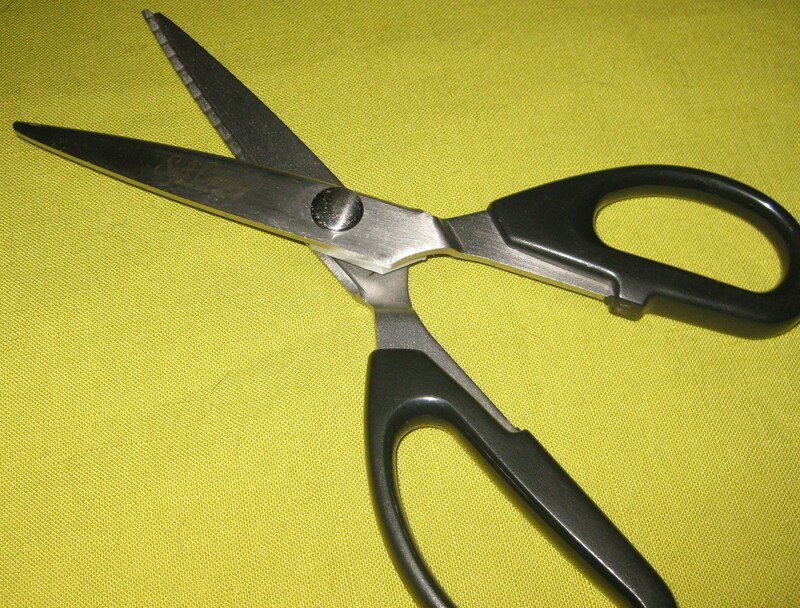 Prevention is better than cure so be careful not to drop your scissors on to a hard surface; do not expose them to moisture and do not try to cut other than fabric with your fabric scissors. The occasional use of fine tissue paper to aid with cutting slippery and fine fabrics will not usually cause a problem. Cardboard, boning, plastic etc is another story! A lot of fluff occurs when fabric is cut and sewn so lightly polishing your tools with a soft cloth after each session is very beneficial. I am often asked about having scissors sharpened and I have to say that finding someone to do this has become harder over the years. I usually suggest enquiring where quality knives are sold. However, with diligent home maintenance and having a few pairs of scissors to rotate, I usually don’t have any problems. 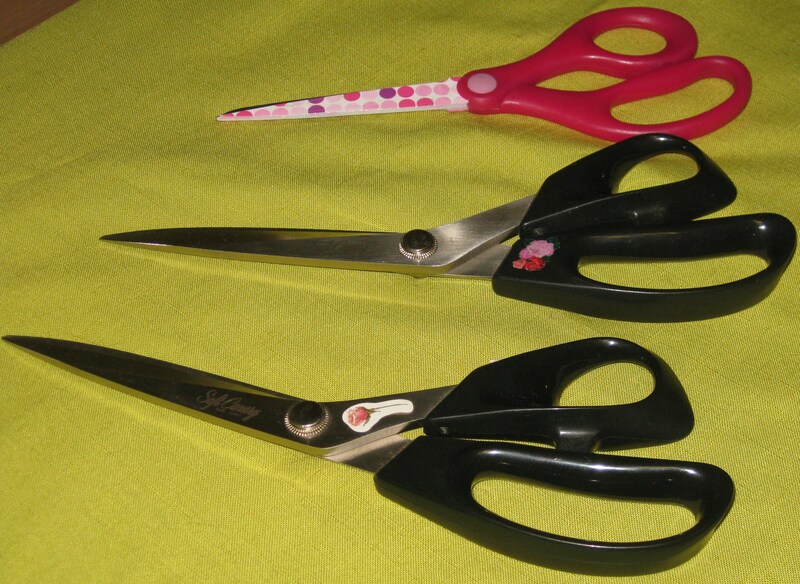 Anyway, because I love scissors, an excuse to replace a pair would not necessary be a bad thing! As visitors to my studio will attest, I love books! Over the years I have accumulated a wide variety of books relating to dressmaking, pattern making, fitting and alterations, fashion styling and assorted fabric and embroidery techniques. I have always enjoyed reading and, whenever I find an intriguing technique, I love to make a sample and think about how I can work my new skill into the next project. I am often asked about the best book for beginning sewers. 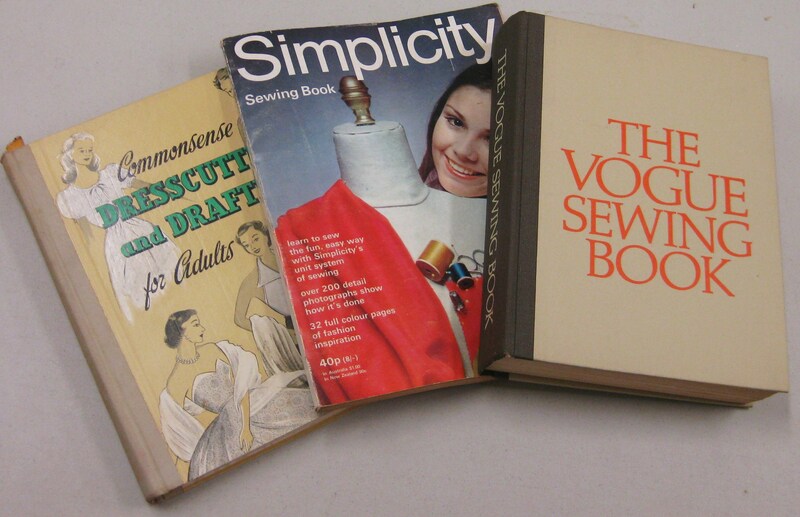 A couple of reasonably priced and very good selections are “Teach Yourself to Sew” and “Easy Guide to Sewing” – both published by Taunton Press. They are both well illustrated comprehensive and with easy to understand information about basic sewing techniques. “Teach Yourself to Sew” comes with an instructional DVD as well. They are also both available as E-books. For those interested in assessing fit and making alterations, there are many books on the market. All of them offer great information and illustrations and will most certainly guide you to a good result. I have been using the following publications with great success over a number of years – “Fit for Real People” by Pati Palmer and Marta Alto and “Fast Fit” by Sandra Betzina. When it comes to information about fabric, my go to books have been Claire Shaeffer’s “Fabric Sewing Guide” and “More Fabric Savvy” by Sandra Betzina. Both of these books contain descriptions of many different fabrics with suggestions for their use and what equipment and techniques will work best when using them. My newest acquisition is “The Mood Guide To Fabric and Fashion”. which has been published by Mood Fabrics in New York. This store came to prominence as the supplier of fabrics for Project Runway in New York. At first glance I believe it will be another excellent reference book. It has lots of information to consider when buying fabric and deals with a lot of the newer textiles which are rapidly coming on to the market. – I believe this is the definitive book for working with knit fabrics and a must for all sewers. In recent years, there have been several books published which as well as providing excellent, well presented information also include patterns which can be traced off to make a selection of garments featuring different technique elements. These are well priced and have a lot of appeal to younger sewers. “Gertie’s New Book for Better Sewing” and “Gertie Sews Vintage Casual” by Gretchen Hersch include excellent technique instruction based on tried and true techniques which focus on accuracy and quality results. 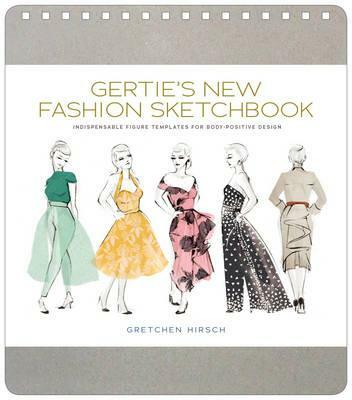 She has also recently published “Gertie’s New Fashion Sketchbook” which is great for budding designers as it contains 300 figure templates which are proportionally true to the female form and adaptable to different body types. I hope you will also enjoy some of these books – perhaps Santa might like a clue or two! As mentioned in Part 1, the fabric used in a garment will always need underpinnings to support its structure. This blog covers which are mostly used in more complex, structured garments such as very fitted and/or strapless bodices, low or wide necklines, the hem on full skirts as well as in tailored jackets and coat. Ends of boning are covered for the comfort of the wearer. Spiral steel boning, which moves with the body, is the most comfortable to wear with a very close fitting garment – cotton tubing is sewn to a foundation with capped steel pieces slid into place before the tubing is stitched closed. Spiral boning with capped ends; insertion tape. 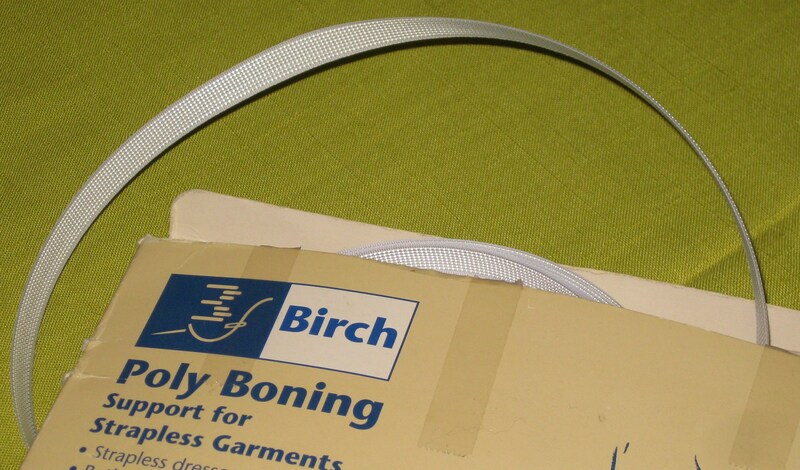 Polyester boning can be stitched to a foundation which is incorporated into the garment or applied to seam allowances, or slid inside a fabric tube which is stitched in place first. Smooth side lies against fabric; machine stitch in narrow lip on either side. Made from polyester webbing, horsehair braid is a flexible tape which comes in various widths. It is used to stiffen and support hem edges on full skirts, helping them to stand away from the body. 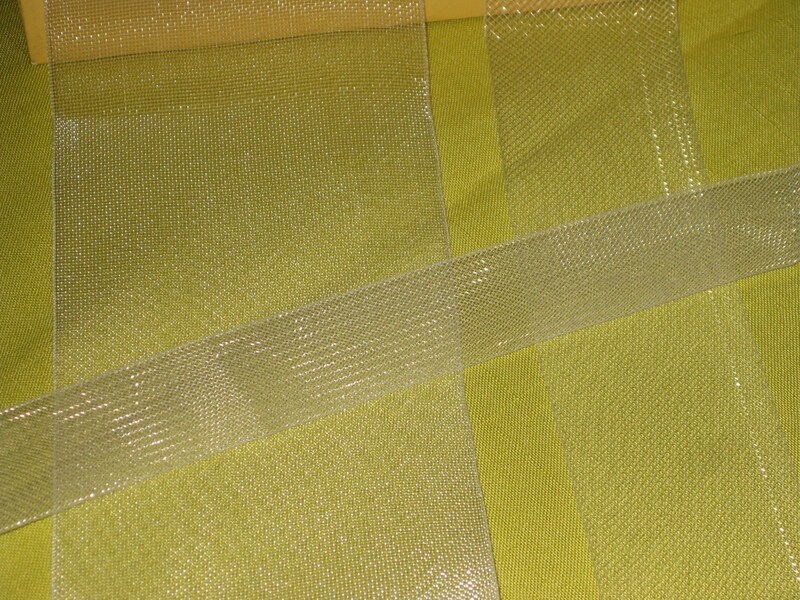 Polyester horsehair braid in various widths will support hem of full skirt. 5cm width can also be used to support top of strapless bodice. It is quite malleable and soft and can also provide additional support at the top of strapless bodices. Basic instructions for its insertion follow; however, I prefer to use an additional piece of lining or garment fabric to cover the braid so that it is not able to be seen once the garment is completed. The top of this additional fabric can be handstitched in place to the underlining. Basic instructions for using horesehair braid. 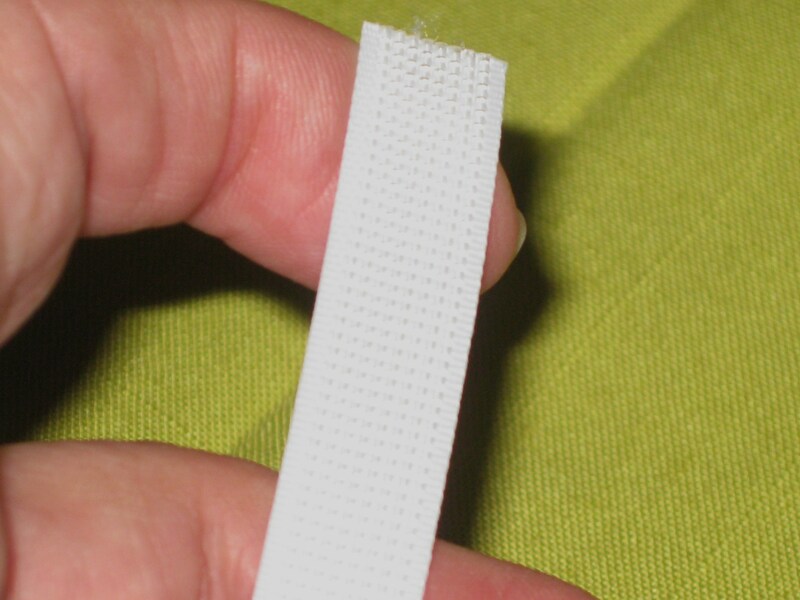 To prevent gaping in deep or wide necklines, an elastic stay using 3mm elastic can be applied to the seam allowance between the garment and the facing – simply attach the elastic at one end and catchstitch over the elastic to form a casing; tighten the elastic without drawing up the neckline and finish the remaining elastic end with back stitches. Neckline/shoulder stays hold the shoulder and sleeves in place with a wide deep neckline in the front and back. They are made from narrow braided elastic couched in place with catch stitch and fastened at each end. Stay tape can also be used to shrink and stabilise gaping areas, for example deep and V necklines, roll lines on lapels and the front edges of an unlined cardigan style jacket. Rayon Petersham waist stay fastens around the waist to keep the skirt in place and take the strain of the zipper when it is being opened and closed. 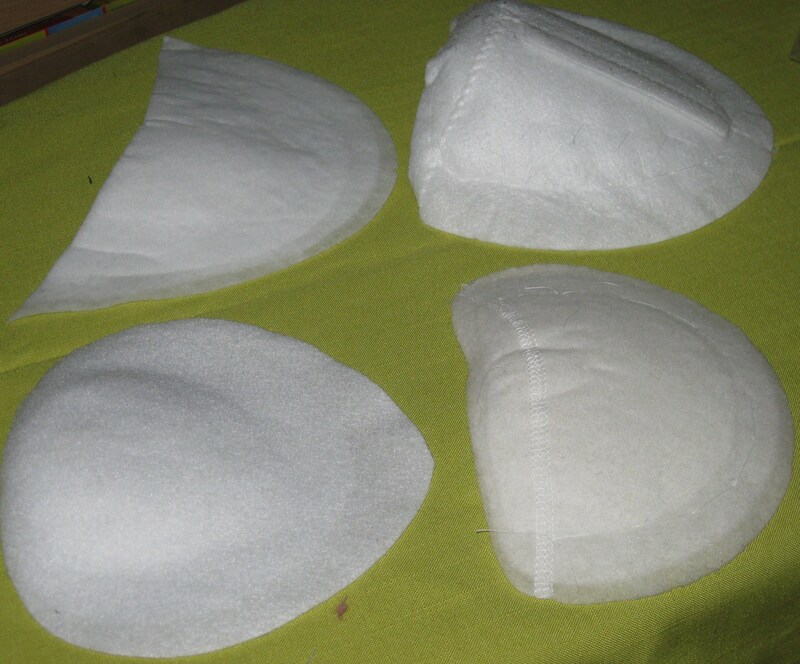 Straight shoulder edge pads – long end goes towards the front of the garment. Custom fitting sleeve head with shoulder position marked with a snip and corners rounded.